In Liz Duffy Adams' Or, the medium is the message. For this comedy set in 1660, that medium is farce, wrapped around a bit of biography and clever dialogue reminiscent of Restoration wit and topped with a bawdy look at sexual freedom. The farcical frame makes the biggest impression, resulting in a playful 90-minute romp that calls attention to performance as artifice. With a fusillade of slamming doors and the quick costume changes necessary for two actors to play six characters, while the central character flirts, writes and utters witticisms, the play is more a meditation on theatrical deception than a character study. But deception is perhaps the bedrock quality of our hero, Britain's first professional female playwright, Aphra Behn. Behn was a prolific writer and an especially obscure historical figure who may herself have taken pains to hide her past. The handful of facts about her establish that she worked as a political spy, was an early novelist and wrote 19 comedies that place her alongside John Dryden as a leading Restoration playwright. Adams builds a play around the deception in Behn's life, using farce to conceal characters behind the silly bluster of their misadventures. Anyone concerned that a play in which men wear wigs will be uncomfortably fussy can rest easy. The characters are thoroughly modern. The laughs in Or, depend on wordplay no more complicated than a sitcom's. Some, in fact, depend on expletives and ribald overtones that have a neat power to shock when uttered by people wearing corsets and brocade. The play collects the key figures in Behn's life and takes a few forgivable liberties. Since it's possible Behn intersected with King Charles II by dint of her spy work, Adams trades on Charles' well-documented promiscuity to imagine an affair between the writer and the monarch. It's plausible enough, and the play's bravura conception is in keeping with the humor of Behn's 17th-century comedies. To the known fact that the actress Nell Gwynne had a long liaison with Charles II, Adams adds the imagined notion that she may have had a dalliance with Behn as well. Gwynne was provocative and sometimes dressed as a man; add that to the temper of the times, and the YOLO personality Adams constructs for Behn and the story rings true. Sarah Carleton's direction keeps the movement and pace razor sharp. Adams never provides the real engine of farce: a sense that the action is escalating past control. In this story, Behn wants to finish her play, keep the king happy but out of her hair and assure Nell that she'll get around to getting it on. There's no hyperbolic crisis, but Carleton keeps the accelerator pedal down to make it a rollicking joyride. If Adams creates a flimsy plot, she compensates with graceful dialogue, making the lines sparkle and the wit flow. She flirts with a meta construction, superimposing the 1960s on the 1660s from time to time, the better to keep the audience aware of the cyclical nature of social values rather than a linear progression from then to now. The "or" in the title is not so much "or" as "more" (and, yes, it contains a pesky comma). Behn's energetic pursuit of art and fame stems from embracing possibilities and ignoring restraint. She flirts with Nell and Charles with equal zest, as if her sensuous curiosity simply doesn't recognize gender. But sexual ambiguity isn't treated as deliverance in this play. Nothing threatens the breezy sexual confidence of Behn, Nell and the king, and no epiphany triggers it. It's just how they choose to live. Or, has plenty of kissing. Carleton develops these moments so the play transcends typical stage kisses, which are often mere placeholders for emotion. She nudges these scenes to the edge of rapture and then lets the play spring its verbal trap, for Adams has her characters ever oscillating between flirtation and coy retreat. Carleton burnishes each set piece to bring the characters' essential needs into view even as she maintains rip-roaring blurs of action. By allotting just enough time for the steely gaze or the giggled demand to show what a character wants — ink, money, fame, fortune, whiskey — the director makes each entrance and exit tell a swift story. Adams' Aphra Behn is saucy to a fault, so actor Chris Caswell cleverly grounds her in impeccable diction and posture to give her character's operatic lust for life a sparkling dignity. With upright carriage, Caswell captures not just the historical period but the self-command necessary to make one's way in the world using only wit and words. Her amorous come-ons generate bright sparks, while her bustling comic turns shatter manners without overplaying the jokes. She's a gem. John Nagle uses precise vocal and physical shadings to reveal the differences in class that distinguish King Charles II from William Scot, a traitorous spy and souse. His Charles has the world by the tail, while Scot has to do a lot of scurrying to stay ahead of it. Nagle then gets a fun turn as Lady Davenant, the theater producer hustling playwriting talent on her own terms. Nagle's restraint pays due respect to the acting challenge of switching gender, with just enough campy mischief. Haley Rice renders Gwynne rather grand and swanny, with the very narcissism that today's celebrities consider so crowd-pleasing. The satisfaction with which she inspects her own leg, cross-dressed in pantaloon and hosiery, lacks only the selfie. In her other roles as servant and jailer, Rice is hilariously earthy and gets to run the biggest gamut of accents. Rice is nicely caught up in each moment, and when her Nell extols the 1660s as a golden age, she makes a convincing case. Behn's libertine life is the play's central conceit, and Adams constructs a fine model of a woman spouting wit and unabashedly seeing to her own needs and pleasures. The show is more fluff than substance, but the farcical high jinks put the audience in pleasant anticipation as characters dart on and off in new disguises. 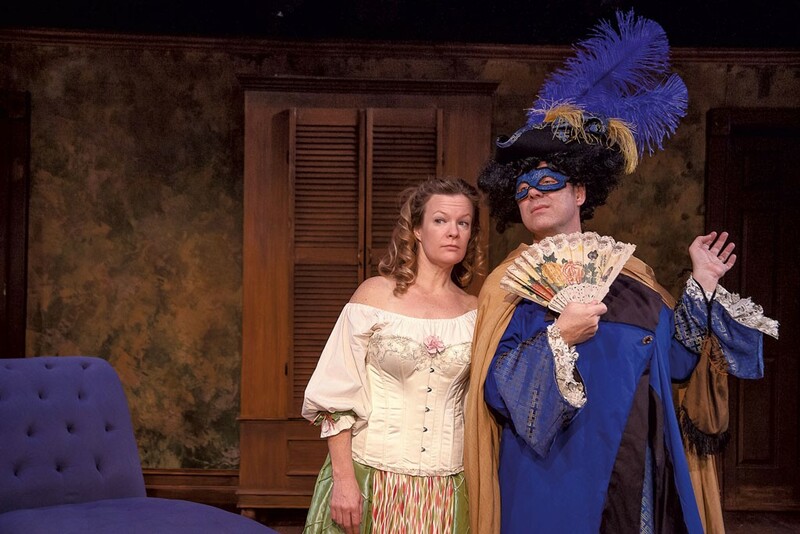 The emphasis on artifice adds a layer to the play, and if we learn only a little about Behn, we are reminded what makes theater, in any age, so much fun. Or, by Liz Duffy Adams, directed by Sarah Carleton, produced by Vermont Stage Company. Through February 15: Wednesdays through Saturdays, 7:30 p.m.; Sundays, 2 p.m., at FlynnSpace in Burlington. $28.80-37.50. The original print version of this article was headlined "The Swingin' '60s"